The ESPION Infinite MOD and ProCore Conquer Tank consist the Joyetech ESPION Infinite Kit which comes with the unique gorgeous tunnel light and intuitive color display. By the way, this kit comes with dual AVB 21700 batteries. 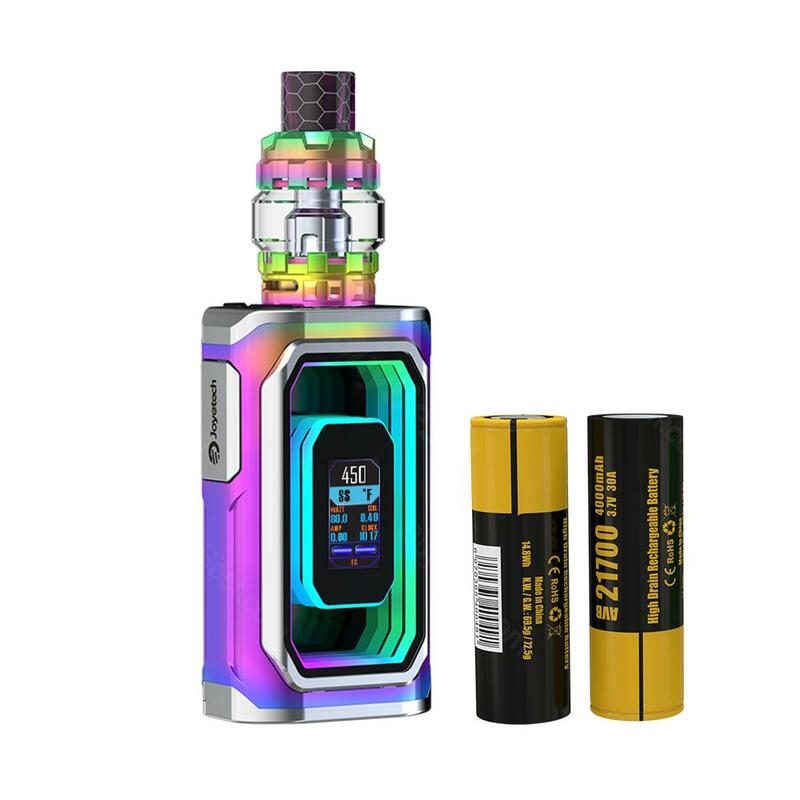 Joyetech Espion Infinite Kit with ProCore Conquer Tank, which has 0.96-inch TFT color display to clearly show status of vape, comes with sparkling LED light. In addition, it is powered by dual 21700 or 18650 batteries(with adapter) to fire up to 230W and charged quickly to save your time. What's more, it adopts advanced ProCD-0.15ohm coil head to deliver pure flavor and several protections that include onboard reverse polarity protection and dual circuit protection to ensure high performance. Easy top refilling and bottom airflow will also bring convenient vaping for you.The package contains two 4000mAh Avatar AVB 21700 High-drain Li-ion Batteries. • Quick link:230W Joyetech ESPION Infinite TC MOD,ProCore Conquer Tank. • Three-month warranty for ESPION Infinite Mod and ProCore Conquer Tank. Hi... Just received this kit from Bestbuy... Fast and safe shipping first : Thank you guys for excellent service! The box second : I'm a geek and I assume it... I love leds, dazzling and rainbow stuffs... This box is wonderful, very impressive by the size and the confidence it inspires... Battery is in charge and I can't wait to try the ProCore Conquer tank with my favourite liquid... I'll tell you later my vaping impressions (which is very subjective). Anyway, at this time, I'm really satisfied with my order.